Shawn Johnson took the gymnastics world by storm with her dominant gold medal performance for Team USA on the beam at the Beijing Olympics. Now retired, the two-time Olympian works for The Body Department, a fitness and wellness site for young women. We spoke to her after her talk at Bucknell University. What was it like getting to Bucknell? Not very easy. I’m from Des Moines, Iowa, so I’m used to it. Lots of planes, trains, and automobiles. Where are you headed after this? How did you originally get into gymnastics? I started gymnastics when I was three years old. My parents got me into gymnastics because I was a little kid with way too much energy, and then I just fell in love with it. It was incredible, a dream come true. My passion was gymnastics, and I wanted to show the world that what I trained for is what I live for. Was the 2008 Olympics more or less successful than you hoped for? I absolutely loved it. It was everything that I hoped and dreamed for. Did you compete in Worlds? What was that like? Yeah, I’ve competed in Worlds. I’ve competed in many international world games all over! They were all so incredible, and it was amazing to be there! What was your primary event? What was your favorite event? I competed in the All-Around, which is bars, beam, floor, and vault. 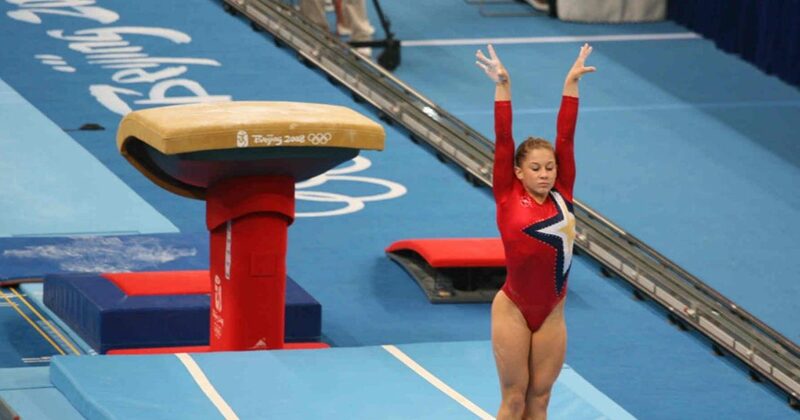 My favorite event was definitely the beam, which is where I won my gold medal. Wow, that’s amazing. I can barely walk across the ground without tripping, so I can’t imagine doing a backflip or more on the beam! I actually can’t walk very well either! I always trip over carpet and everything. The beam is the only place that I don’t trip. What have you been up to since you retired in 2012? Well, I wrote four books, worked on The Apprentice, was on Dancing with the Stars twice, got married, and commentated the recent Rio Olympics! Wow, that’s incredible! Did you get to meet Simone Biles and everyone else? Yeah, they’re actually really good friends of mine! The gymnastics community is quite small, and I actually went on a four month tour around the country with them after the 2016 games ended. So, what’s the mission of one of your companies? One company that started in 2010-2011, called the Body Department, is an online platform targeted toward teenage girls. It’s meant to be a safe environment for teenage girls to learn about fashion, fitness, health, and more. We reached one million followers in one year. That’s incredible. Have eating disorders and body confidence/positivity been close to you? Gymnasts grow up constantly looking at our bodies. We’re competing in front of a large number of people in just a leotard, so it can potentially be difficult with body confidence. I’ve been an advocate for the body positivity movement ever since I was given a voice. So how’d you meet your husband? I actually met his brother at the 2012 Olympics in London, and he introduced us when we came back home. He basically just set us up. Did his brother compete as well? Yeah, he was an Olympic track cyclist. Do you ever keep up your tumbling, or not so much anymore? I play around with tumbling every once in awhile, but nothing like I used to do. I bet you’re tired of hearing ‘traditional’ questions. If you could have one superpower, what would it be, and why? Well, the first thing I thought of was flying. I think that’s why I was drawn to gymnastics, because it felt like I was learning to fly. But then I kept thinking, and I’d also like to be invisible because I’m really nosy and curious.